German states stamps for the Free Hanseatic City of Bremen were first issued in 1855. The state of Bremen consists of two enclaves, Bremen, which is the state capital, and the port city of Bremerhaven. The two cities are located on the Weser River, which connects to the North Sea. The city-state of Bremen is completely surrounded by the German state of Lower Saxony. Bremen stamps, which are mostly scarce to rare, can be divided into the three groups, the first issues being imperforate, the second group of issues being rouletted, and the last group being perforated. The scarcity and high prices of the Bremen postage stamps are somewhat odd, as at the time the first stamps were issued, Bremen was a thriving city of about 122,000 residents. All of the stamps of Bremen, though slightly different in frame design, depict the arms of the city-state, consisting of a key over a shield with a crown above. The four Bremen stamps shown above were issued between 1855 and 1860. The 3 Gr. denomination was printed on horizontally laid or vertically laid paper, and the other denominations were printed on wove paper. They are all unwatermarked and imperforate. Some examples of the 3 Gr. denomination can be found with traces of a marginal paper maker's watermark, consisting of lilies. They are rare. Type I - The central part of the scroll below the word Bremen is crossed by one vertical line. Type II - The central part of the scroll below the word Bremen is crossed by two vertical lines. Type III - The central part of the scroll below the word Bremen is crossed by three vertical lines. Type I - The shading at the left of the ribbon containing "Funf Grote" runs downward from the shield. Type II - The shading at the left of the ribbon containing "Funf Grote" runs upward from the shield. 03 Gr. (1855 - Horiz. Laid - Mi. #1x, Sc. #1) - Black on Bluish Gray. 03 Gr. (1855 - Vert. Laid - Mi. #1y, Sc. #1a) - Black on Bluish Gray. 05 Gr. (1856 - Mi. #2, Sc. #2) - Black on Rose (shades). 07 Gr. (1860 - Thick Paper - Mi. #3a, Sc. #3) - Black on Yellow (shades). 07 Gr. (1860 - Thin Paper - Mi. #3b, Sc. #3a) - Black on Yellow (shades). 05 Sgr. (1859 - Mi. #4, Sc. #4) - Green, Yellow Green. Between 1858 and 1860, a variety of the 5 Gr. stamp was printed, utilizing the inscription "Franco Marken", instead of the "Franco Marke" used on the regular 5 Gr. stamp. This variety was never actually issued. 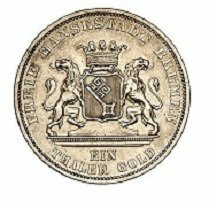 There are many of this un-issued variety around, and they are not expensive, thus - this is THE ONLY AFFORDABLE BREMEN STAMP for many collecting budgets! The stamp is shown in the image above (Mi. #I, Sc. #2b). 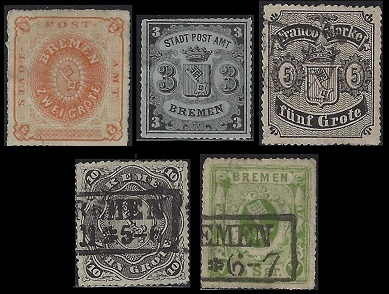 The five Bremen stamps shown above were issued between 1862 and 1864. The 3 Gr. denomination was printed on horizontally laid or vertically laid paper, and the other denominations were printed on wove paper. They are all unwatermarked and serpentine rouletted 16. 02 Gr. (1863 - Mi. #5, Sc. #5) - Orange, Brownish Orange, Yellowish Orange, Red Orange. 03 Gr. (1864 - Horiz. Laid - Mi. #6y, Sc. #9) - Black on Bluish Gray. 03 Gr. (1864 - Vert. Laid - Mi. #6x, Sc. #9) - Black on Bluish Gray. 05 Gr. (1862 - Mi. #7, Sc. #6) - Black on Rose (shades). 10 Gr. (1863 - Mi. #8, Sc. #7) - Black. 05 Sgr. (1863 - Mi. #9, Sc. #8) - Green, Yellow Green. 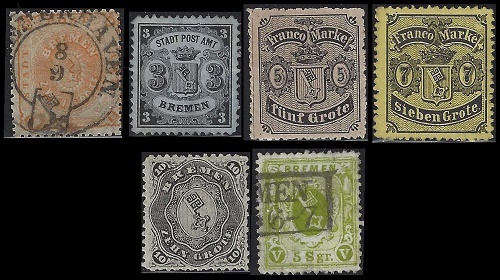 The six Bremen stamps shown above were issued between 1866 and 1867. The 3 Gr. denomination was printed on laid paper, and the other denominations were printed on wove paper. They are all unwatermarked and line perforated 13. 02 Gr. (1866 - Mi. #10, Sc. #11) - Orange, Yellowish Orange, Red Orange. 03 Gr. (1867 - Mi. #11, Sc. #10) - Black on Bluish Gray. 05 Gr. (1867 - Mi. #12, Sc. #12) - Black on Rose (shades). 07 Gr. (1867 - Mi. #13, Sc. #13) - Black on Yellow (shades). 10 Gr. (1867 - Mi. #14, Sc. #14) - Black. 05 Sgr. (1866 - Mi. #15, Sc. #15) - Yellow Green, Olive Green. There are many paper and color varieties on all the German states stamps of Bremen which would make for an interesting, though expensive, philatelic study. There are also many excellent 19th Century forgeries of these stamps, as well as fake cancellations on these stamps. The stamps shown in the images above are authenticated examples. The stamps of Bremen were replaced by those of the North German Confederation on January 1, 1868.